This conservation resource was created by Adam Todd. Biofuels: green economy initiative or more business as usual? Biofuel is the product of the refinement of plant biomass which can then be burned for heat or light energy. It is made of organic matter, either directly from plants or indirectly from domestic, industrial or commercial wastes. Before fossil fuels, firewood was the primary source of fuel domestically, especially for heating and cooking before the 19th century. Materials such as wood, hay, straw, and dung are collected, dried, and then burned as a fuel source. The amount of energy that a well-seasoned firewood can produce is approximately 15 MJ per kg, which is one-third to one-half of what fossil fuels can produce. Even today, nearly 2.6 billion people, primarily rural areas of developing countries, still depend on firewood as an energy source. Because the temperature of a wood fire (approximately 850˚C) is unable to melt many metals, pyrolysis techniques were developed to turn wood into charcoal. Charcoal is a grey-black solid that is carbon-enriched, often burning without smoke and reaching temperatures as high as 2700˚C.. Good quality charcoal can produce 28-33 MJ per kg. Charcoal is commonly turned into briquets and used for barbecuing. Bioethanol is alcohol made by fermentation mostly from carbohydrates produced in sugar or starch crops such as corn, sugar cane or sweet sorghum, in which biochemical reactions are involved. It is an alternative to a highly depended-upon fuel source: gasoline. It is the only renewable feedstock material to create liquid fuel. The method of fermentation is similar to that of alcohol production for human consumption. Samuel Morey, an American inventor in the early 1800's, was the first to design a boat engine fueled by alcohol. It was able to run 7-8 miles per hour. Despite the popularity of gasoline during the early 1900's, scientists supported the sustainability of ethanol in the fuel industry as there was an abundance of potential feedstock for its production. Interest for using ethanol as a fuel was brought up again during the 1973 oil crisis, when the Organization of Arab Petroleum Exporting Countries (OAPEC) declared an oil ban. The ban raised the price of oil from $3 USD to nearly $12 globally. In 2013, The US produced more than 50% of the world's bioethanol, though Europe, Brazil, China and Canada also played significant roles. The predominate feedstocks used for bioethanol production are corn, sugar cane, wheat, sugar beet, and cassava. 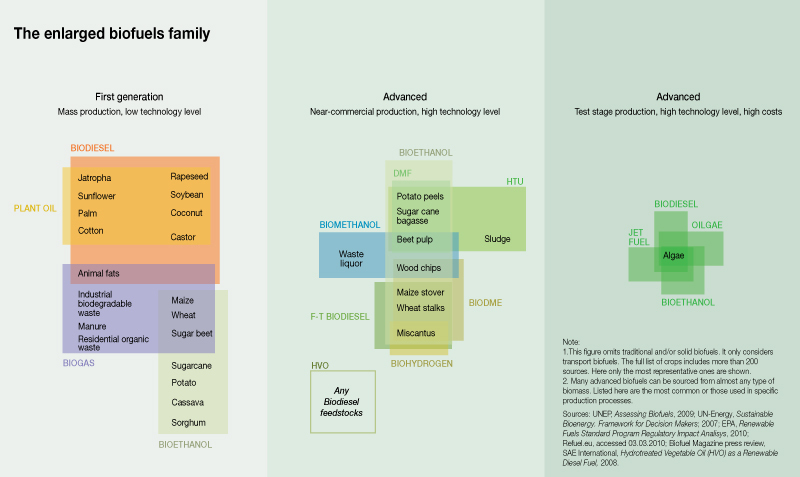 Bioethanol that is made from food crops is considered a "first-generation" biofuel, which means that the feedstock used in production competes with human and animals as a food source material. To reduce the competition, "second-generation" bioethanol from non-food dry plant materials have been created. Examples of biomass that is used are switchgrass, crop residues, yard trimmings, and food processing waste. Because they are non-food biomasses, the feedstocks are not required to be planted on agricultural land. 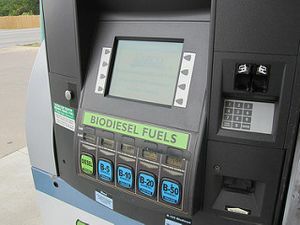 Biodiesel is a yellow liquid that is the product of transesterification from vegetable oil, animal fats, and/or waste grease along with alcohol. It is commercially produced and is a alternative to petrol diesel. Animal fat and vegetable oil were used for lighting lamps in the 1800's, but were not used for making biodiesel until the 1930's. In 1893, German engineer Rudolf Diesel became the first person to create a diesel engine. He believed that the use of vegetable oil could fuel machines for agriculture in rural parts of the world. Between 2000 and 2013, the world production of biodiesel increased dramatically, rising from 213 million gallons to 6289 million gallons. Top production regions include the European Union, Brazil, the U.S., Argentina, and China. In 2013, the U.S. alone produced over 1300 million gallons of biodiesel from soy bean oil. The most commonly used biodiesel blend in the US is B20, which is a blend of 20% biodiesel and 80% petroleum diesel. The benefits of biodiesel are ease of use, production simplicity and cost-competitiveness. However, the ability to economically produce renewable feedstocks such as animal fat and vegetable oil sustainably is what will create a promising future for biodiesel. Biogas is a renewable alternative to natural gas that is created by anaerobic digestion of organic wastes. Raw biogas contains methane (CH4), carbon dioxide (CO2) and water vapour (H2, and H2S) that can be purified to become pipeline-quality biogas (or biomethane). Organic wastes, such as plant residues, can decompose to carbon dioxide and water in natural environments with sufficient air supply and microbial activity. However, in anaerobic conditions plant residues will undergo anaerobic digestion, being broken down to methane and carbon dioxide by microorganisms. An anaerobic digester. By Chinese training pamphlet, several sources including Institute of Science in Society. Public domain. China is currently the largest biogas producer, harvesting 6 billion Nm3 of biomethane per year. The potential for biogas continues to grow. More than 1 trillion N m^3 of biomethane could be harvested considering the amount of agricultural byproducts and domestic wastes created . This in turn can cover a quarter of the worlds current natural gas consumption and 6% of the global demand for energy. Create food/fuel competition for resources. Drought-tolerant, low input requirements and suitable for marginal lands. It is drought-tolerant, can be grown in shorter season with less labour requirements. Audi, the German car manufacturer, has announced a new fuel technology which they call "e-Diesel". "E-Diesel" is entirely manufactured in a factory that only requires inputs of electricity that can be generated through renewable energy sources, water (H2O) and carbon dioxide (CO2) that can be found excessively in the atmosphere. With its consumption, it's only output is oxygen (O2). In cars running on "e-Diesel", they claim that a zero carbon-footprint can be achieved. In this section we welcome contributions from scholars and students that widen the scope alternative biofuels considered in this case study. Land use change is a major issue regarding biofuel production. From directly growing energy crops to raising domestic animals whose fat can be converted into biofuel, every step requires planning and land management. 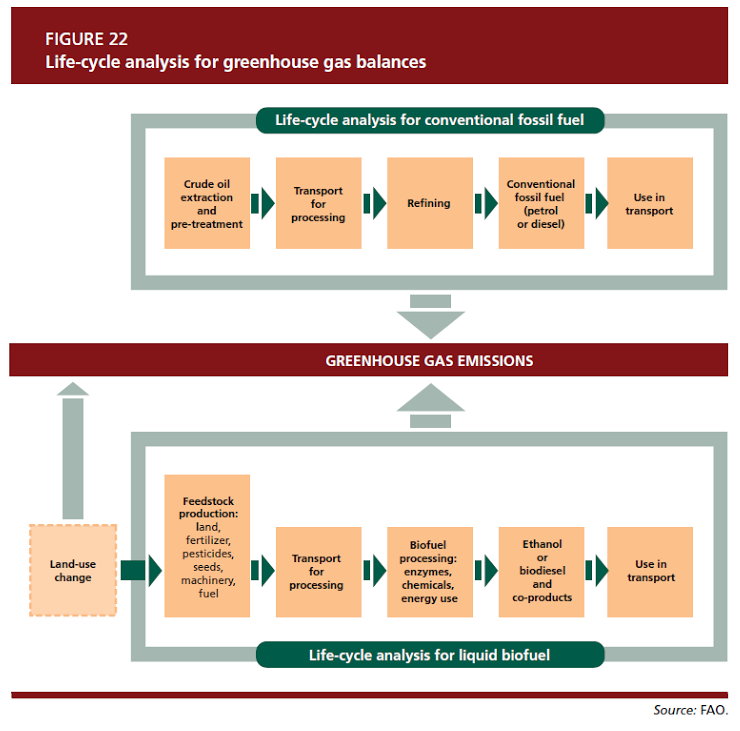 Systems for land and agronomic management are critical evaluation tools for analyzing the global scale impacts of biofuel and its dependability in the future. There are two kinds of land use change: direct land use change (dLUC) and indirect land use change (iLUC). Remote-sensing is a common method to estimate the severity of land use change such as deforestation. Reports published by the Food and Agriculture Organization (FAO) further state that there may be indirect effects of land use change, such as increases in carbon emissions as more land is converted to biofuel crop production in response to global demand. Furthermore, the FAO also warns that biofuel production may have a higher carbon footprint than fossil fuels once land-use changes are factored into the analysis. It is clear that the benefit of biofuels is questionable and that it can either contribute to climate change mitigation or be a GHG emission intensifier. Undoubtedly, appropriate locations for biofuel plantations are critical for sustainable production. Producing biomass on less productive areas may alleviate the land use competition with food and improve the agronomy and ecology of the area. Bioenergy industries are delving into the potential of marginal lands and degraded lands as alternative to cropland and feedstock supply to address the food versus fuel debate. Marginal lands suitable for cropping shares 19% and approximate 298 Mha of cultivated lands Globally in 2010. Some generally recognized benefits of replanting biomass on marginal and degraded lands include reducing pressure on ecosystems and natural land conversion while providing soil stability and productivity, increasing soil nutrient and water content, and recreating habitats. However, others argue that the environment will be better protected through sustainable agriculture, reducing agricultural inputs, and restoring degraded lands. How to define these marginal and degraded lands and soil. Agroeconomic profitability is no longer sustainable criterion to define marginal and degraded land. Multiple criteria are suggested using soil health indicators, current land use and environmental degradation. The value of marginal lands should also be deliberated according to its social and cultural importance. Some marginal areas constitute a primary source of livelihoods for the rural poor, provide ecosystem services, and hold biodiversity values. 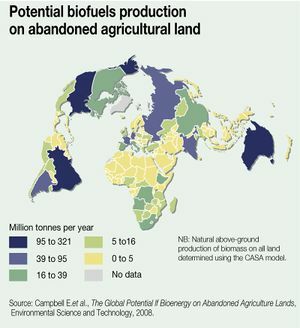 Production of energy crops is one of many purposes competing for the use of degraded land. In the long-term, competition for land will only become more pronounced due to increasing demand for food production and urbanization. GHG benefits of growing energy crops on marginal and degraded lands do not compare to restoration of natural vegetation and soils. 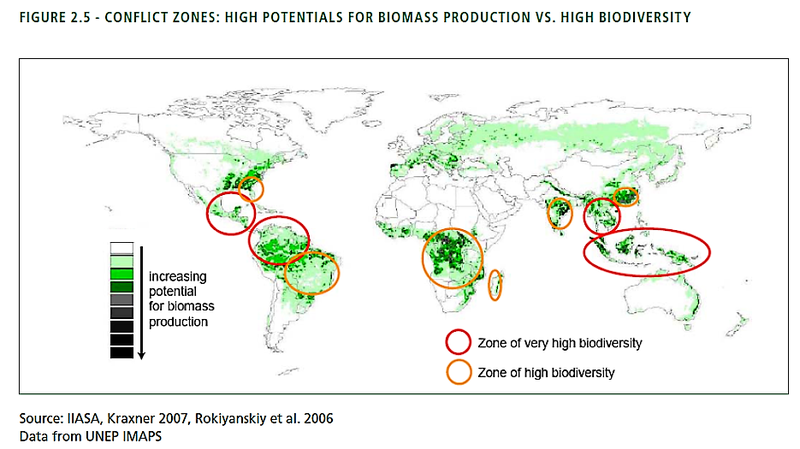 Biodiversity is another important element to consider when analyzing the consequences of Biomass production. Practices of crop monoculture can be detrimental to local biodiversity through habitat loss, expansion of invasive species, and contamination from fertilizers and herbicides. Generally single-crop biofuel plantations have been reported to have low species diversity and can increase soil erosion. On a field-scale, the most efficient cropping systems have great uniformity and very little biodiversity. Choice of crop and management regime is therefore an important element in determining whether the biofuel is biodiversity friendly. Rising demand for biofuels escalates the incentive for the clearing of natural habitats. For instance, palm oil plantation development is one of the most cited causes of natural habitat conversion in Southeast Asia, which continues to lose its primary forests, thus endangering the region’s biodiversity. Oil palm plantations have estimated to remove 78% to 85% of recorded native species in primary forests of Indonesia and Malaysia, and supports lower levels of biodiversity than other tree crops, agricultural crops and abandoned pasture. Dominant species on these plantations are often invasive or non-forest generalist species, which replace specialist species important for a functional ecosystem. Habitat fragmentation is also a threat to native species of continuous forest. The development of infrastructures and burning of forest land to create oil palm remain a threat to many species in Southeast Asia, such as the Sumatran rhino, Asian elephants, tigers, and Borneo orangutan. In this section we welcome contributions from scholars and students that widen the scope of environmental considerations posed in this case study. Worldwide demand for biofuels has been growing rapidly in recent decades. Production is estimated to reach 51.1 billion gallons by 2022, up from 32.4 billion gallons produced in 2013. 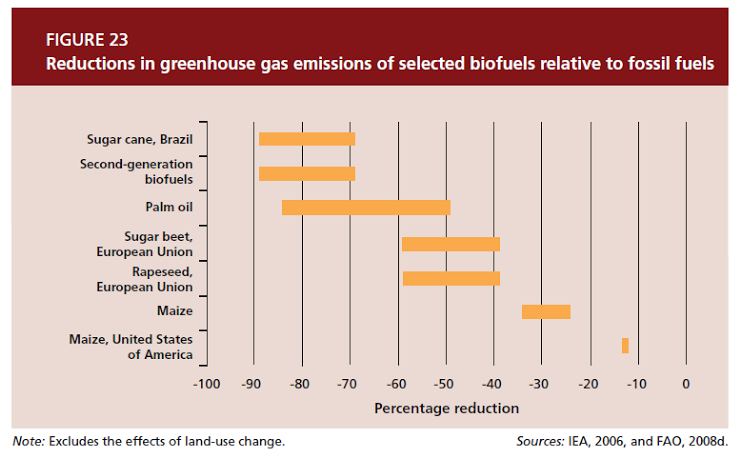 However, the economies of scale in the biofuel industry has demonstrated the problems it can cause, including encouraging agriculturalisation of carbon-rich forested land leading to the rapid expansion of the frontier in Brazil, and encouraging the use of pesticides and fertilisers to press for higher crop yield Consequently, the carbon emission problems biofuels aimed to remedy in the first place can actually be escalated due to the massive scale of production. If forest removal is considered in carbon emission calculations, the total emissions can be between 17 and 420 times greater than if just considering production alone. Since biofuel production requires the same lands that are used to traditionally grow food, the food price increase in recent years should have contribution from the expansion of the biofuel industry. Furthermore, Rice (2010) has claimed that the biofuels option is merely an easy way-out for politicians. To the global commons, biofuels, with the competition they induce on farm lands, are believed to have put 100 millions people back into poverty with the food price crisis in 2008, evidenced by the World Bank's estimation. Although biofuels mandates are mostly from government policy-makers, it's businesses that take on the commercialisation "quest" to deliver this technology to consumers. Potential risks that may forbid actual companies to invest in biofuels production include: (1) unknown and hard-to-predict technical and non-technical consequences by innovative products; (2) potential impacts on the demand-supply status quo; (3) raising food security problems; (4) uncertainty in competition with "oil giants"; and (5) inadequate infrastructure to support such production processes. Biofuels have been controversial regarding spikes in food prices and the resulting social unrest such price increases have caused. The rise of food prices correlate well with the increased diversion of corn and soy from the food supply to biofuel production. 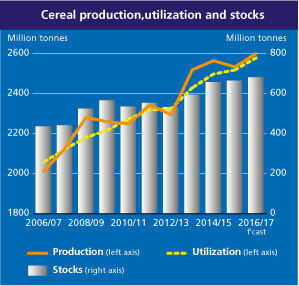 Though also involving complex political issues, the rising cost of cereal prices played a major role in protests that developed into the Syrian Civil War. Similarly, food prices also played a major role in the series of uprisings that became known as the Arab Spring. In Cairo, for example, waving bread became a symbolic gesture of outrage at food price rises which rose as high as 300% in 2011. The rise in food prices in that year can be attributed to several factors that reduced the overall global supply, including extreme weather conditions in Russia, Ukraine, Australia, and Canada that reduced crop yields. Many issues have been raised about diverting crops from the food supply to produce biofuels, including concerns over biofuel production decreasing the global food supply, and the replacement of food crops with corn or sugar cane for biofuel production increasing food costs. Industrial corn production uses a large amount of chemical fertilizers and pesticides (97% of acres of corn in the US have applications of both nitrogen fertilizer and herbicides) which is an ecological sustainability concern in terms of greenhouse gas emission and runoff pollution. However, the threat of collapse of nation-states or societies from unequal access to food poses a serious threat to the ecological, social, and economic sustainability globally. In 2007, Jacques Diouf, then-Director-General of the United Nations Food and Agriculture Agency (FAO) warned that if trends regarding biofuels were to continue world hunger would rise, especially in the developing world. Similarly, the United States National Institutes of Environmental Health Sciences (NIEHS) warned that biofuels further tie food prices to the price of petroleum and force people to compete with automobiles for energy. There is as yet no consensus on the real-world impact of biofuels on food prices, though generally as the price of petroleum rises, the price of biofuels increase, which in turn causes price increases for the agricultural commodities used to produce them. Analyses of the level of price increases of agricultural commodities from diversion for biofuels have ranged from increases of 14% to 43%. Another concern of biofuel production is the replacement of food crops with biofuel crops. Since biofuel subsidies were introduced in 2005, the land dedicated to growing corn in the US has risen by more than 20 million acres. 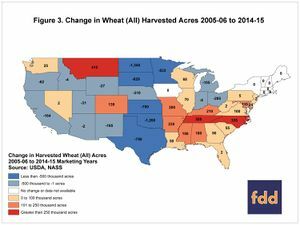 Wheat production has seen a corresponding decline of acreage of nearly 4 million acres, as well as reductions in area dedicated to rice and peanut production. This trend has been seen in other parts of the world as well. Brazil is another major producer of biofuel from sugar cane, which has displaced agricultural commodities that are important staple food crops. Possibly because it’s a more efficient producer of ethanol than corn, the effect on food prices hasn’t been as dramatic with sugar production. Major environmental deficits revolving around biofuel production are caused by the imbalance between biofuel crops and other biota. This is due to the need for and the lack of effective management strategies for scarce and competitive resources, such as land, water, and other agricultural inputs. The full extent of negative impacts on the environment, based solely on land use change, cannot be easily determined. 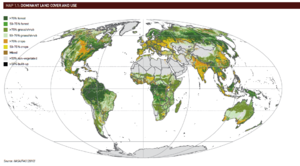 As the balance between crop growing and natural ecological reservation varies from one area to another, multi-level (global, regional, local) negotiation and planning should be implemented to develop a comprehensive and equitable land use policy that serves to provide a sustainable balance for biofuel production in the environment, fully exploiting the possibility of coexistence between fuel production and the environment with the least compromise. Food production serves as one of the basic necessities for a functional economy and should not be challenged by biofuel crops. Autocratically providing incentives for biofuel production to achieve economic or political goals will only isolate environmental considerations from decision-making. This is inappropriate because the ecological services serve as the basis for the continued existence of all economies and polities. Hence, before pushing biofuel products into the market, policy-makers should seek to organize an investigation to produce estimates for actual business owners about the capacity of biofuel production the economy can withstand without further decreasing the capacity of the environment to provide consistent natural resources. Competition for food crops represents a major impact from biofuels to agricultural food production by land use repurposing. This can contribute to increased carbon emissions from the agricultural industry. However, it also has potential increase social unrest by causing increases in food prices. Policies should be set to reduce or eliminate biofuel-caused food scarcity, and the price increase it causes. This can be accomplished by mandating reductions, and eventual elimination, of first-generation biofuels made using food crops, and promoting the development and adoption of second-generation biofuels that can be produced using other materials such as agricultural waste (crop residue), municipal wastes, and algae. During policy-making, crops with important cultural meaning should obtain additional attention to avoid conflicts, which can weaken nations' agricultural capacity and overall stability. A recent of such instability is Egypt during the Arab Spring, wherein prolonged conflict led to detrimental ecological degradation. In this section we welcome contributions from scholars and students that widen the scope of recommendations offered in this case study. With the purpose of examining the viability of biofuels as a green initiative, this study on biofuels has included the history of biofuels and impacts of biofuels on environmental, economic and agricultural sustainability from the regional scale to the global. Environmentally, biofuels have evidently caused increased competition land resources with natural ecosystems that preserve biodiversity. Economically, biofuels are believably capable of restructuring the contemporary economy by challenging traditionally dominant industries and by modifying the market supply-demand balance. Agriculturally, misuse of land resources and other agricultural products is also pervasive and is causing considerable destruction to the basic functionality of agriculture: sustainably providing food for humanity. We have thus concluded with the following recommendations: to enforce the idea of balance in managing biofuel production with natural resources; to take careful steps in implementing biofuel products in the market; and to guarantee the production of traditional food crops on arable lands. In this section we welcome contributions from scholars and students that widen the scope of conclusions drawn from this case study. ↑ Urbas, J., & Parker, W. J. (1993). Surface temperature measurements on burning wood specimens in the cone calorimeter and the effect of grain orientation. Fire and Materials, 17(5), 205-208. ↑ Jansen, R. A., & Wiley InterScience (Online service). (2013;2012;). Second generation biofuels and biomass: Essential guide for investors, scientists and decision makers (1. Aufl. ;1; ed.). Weinheim: Wiley-VCH. ↑ Leon, A., & Leon, R. (2016). The Scope for Increasing Biofuel Crop Production in Japan: An Analysis of Alternative Policies. Asian Economic And Financial Review, 6(3), 115-126. ↑ Rocchi, B., Romano, D., Hamza, R. (2013). Agriculture reform and food crisis in Syria: Impacts on poverty and inequality. Food Policy, Volume 43, 190-203. ↑ Tenenbaum, D. J. (2008). Food vs. Fuel: Diversion of Crops Could Cause More Hunger. Environmental Health Perspectives, 116(6), A254-A257. ↑ Bastianin, A., Galeotti, M., & Manera, M. (2016). 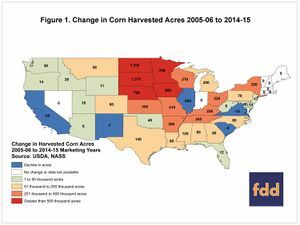 Ethanol and field crops: is there a price connection?. Food Policy, 63, 53-61. ↑ Persson, U. M. (2014). The impact of biofuel on agricultural commodity prices: a systematic review. Wiley Interdisciplinary Review: Energy and Environment, 4(5), 410-428. ↑ Sayffarth, A. R. (2015). The Impact of Rising Ethanol Production on the Brazilian Market for Basic Food Commodities: An Econometric Assessment. Environmental and Resource Economics, 64(3), 511-536.